Wing span (spanwijdte) 2080 mm 82"
Note: selection of retract is mandatory. Wing Covering Material: Covering, painted, decals applied and clear coated. The aircraft has a beautiful flat, non-glossy finish. This is superior to glossy covering materials. 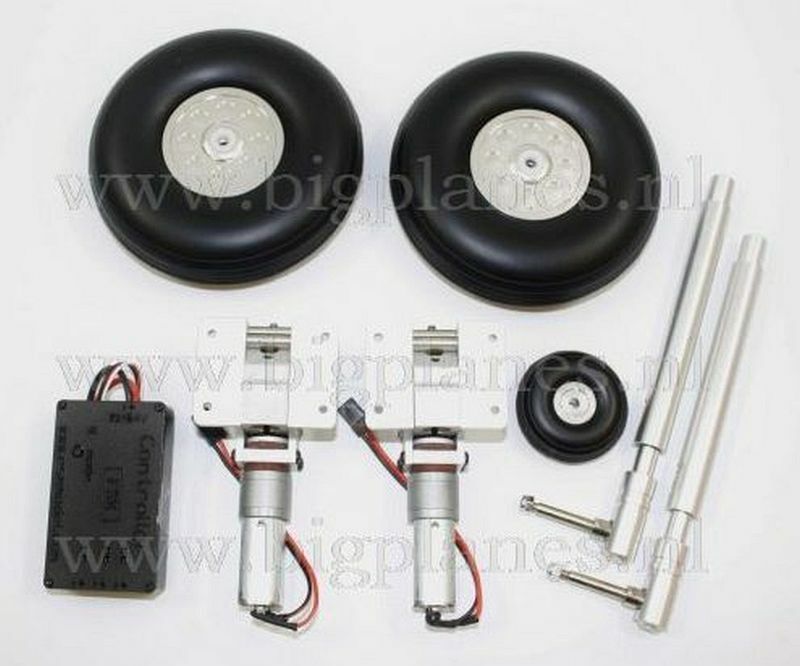 The covering material is a brand name covering which has a special paint adherant layer. The covering goes on clear, and is then primed and painted, then clearcoated. 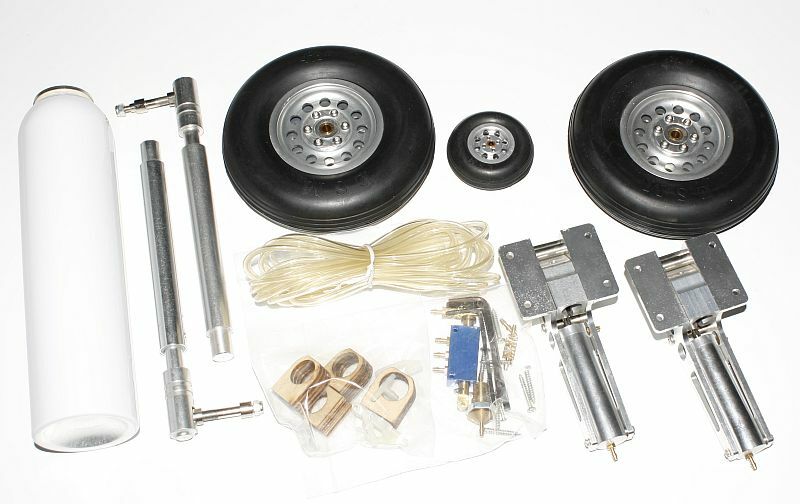 Rotating retracts: including alloy wheels, oleo struts and electric retract system. Incorporate all of the latest design improvements. 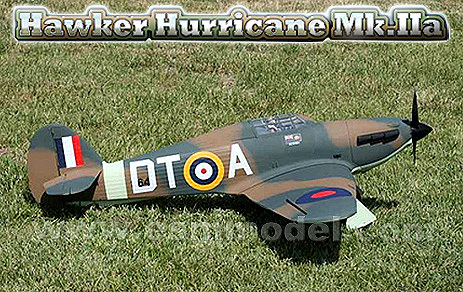 The hurricane was designed in response to an Air Ministry request for a design to utilize the new Rolls Royce Merlin engine. After the design was rejected as 'too conventional' by the air ministry, the design was continued as a private venture. 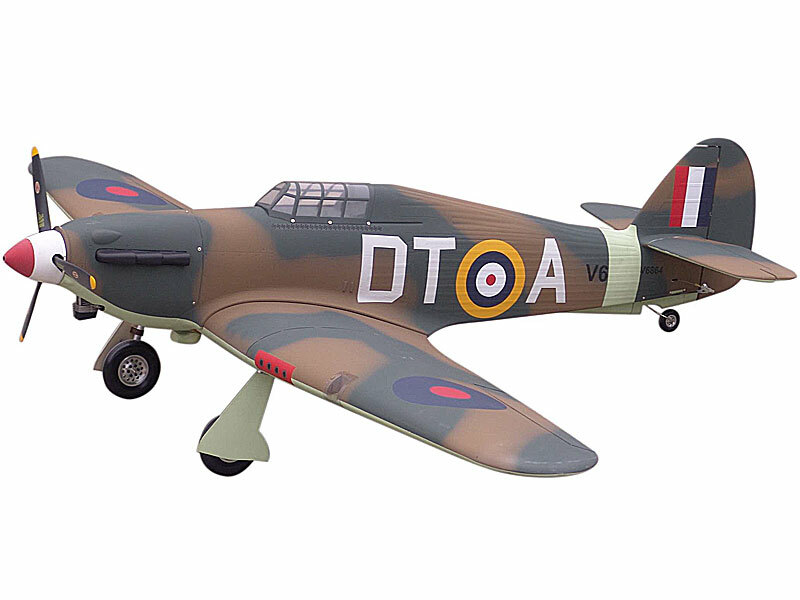 To keep costs low, Hawker used many parts from existing aircraft, which is why the Hurricane looks so similar to the Hawker Fury; it is essentially a monoplane version. 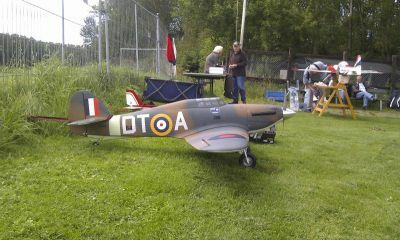 The aircraft first took to the sky in November of 1935. Despite being considered obsolescent, the Hurricane provided the defense of England during the Battle of Britain alongside the more famous Supermarine Spitfire. Despite the enduring image of the Spitfire as the aircraft which won the battle of Britain, the Hurricane actually scored more kills: 1,593 out of the 2,739 total claimed. This was in part to its design. 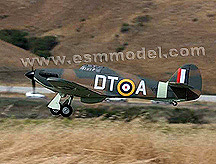 The Hurricane's close arrangement of 4 .303 calibre machineguns in each wing meant a closer convergence point when fired. This was useful against the heavier and more armoured German He-111 and JU-88 bombers. In combat with fighter aircraft, this was a less useful advantage, and the other aspects such as speed, climbing and diving rates and turning radius were more important, in which the Hurricane was not as capable. 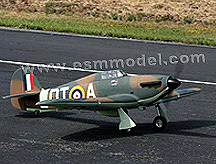 Still, the Hurricane was a durable and effective fighter instrumental in the defense of England. 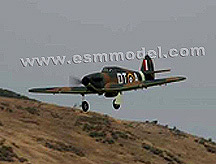 After the Battle of Britain, the aircraft was sent to other theatres, such as North Africa, the defese of Malta and Indo-China. The RAF also trained Russian pilots on the hurricane, and thousands were sent to aid Russian forces from the German invasion. 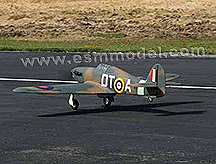 This model is of the aircraft flown by Tuck between December 1940 and April 1941, when it was destroyed in combat. Having survived, Tuck continued to fly hurricanes until he was shot down by anti-aircraft fire over France in January of 1942. 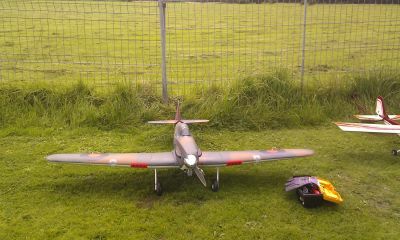 Taken to Stalag Luft II he tried to escape on several occaisons. With the Russians closing in, the camp was to be moved. While being transported away from the POW camp he escaped and ed the Russian forces. He had some knowledge of Russian, which he put to good use, and actually fought with the Red Army until the Russians were able to secure his transport to England. An excellent pilot Tuck was promoted several times, first to Squadron Leader, and later to Wing Commander and Wing Leader. He shot down 27 enemy aircraft with 2 shared kills, 6 probable kills and numerous ground targets destroyed. He was awarded the Airforce Cross, the Distinguished Service Order and the Distinguished Service Cross (with two bars). After the war he was a test pilot of the Electric Canberra before retiring to a mushroom farm. He developed a keen friendship with Adolf Galland after working together on the movie Battle of Britain. 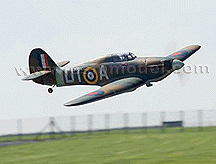 Keen modellers will note the British colonial flag of Burma on the side of the aircraft. This is because the squadron Tuck commanded was no. 257 Squadron, also known as Burma Squadron. The aircraft never participated in the Pacific Theatre. 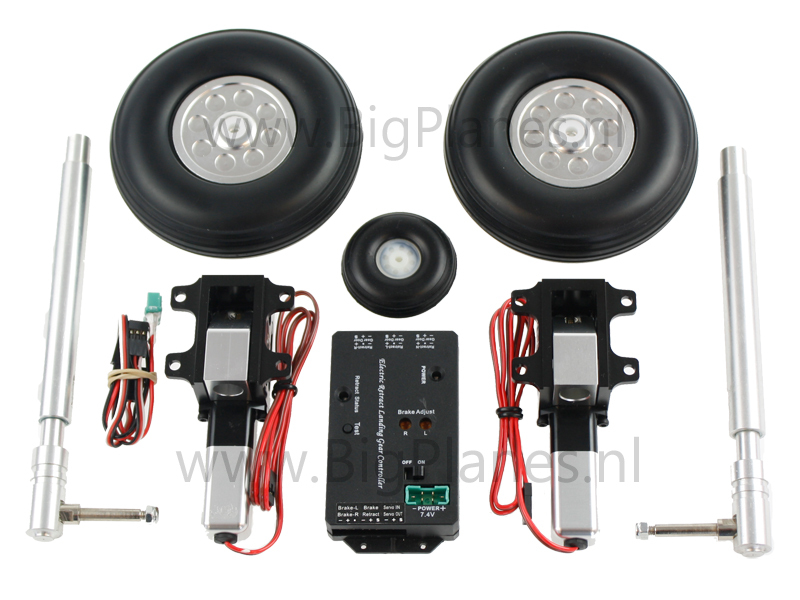 Pictures are taken by Ronald de Wee from FMS Spaarnwoude.